Want to build a personal training business that provides you the income and freedom you want without sacrificing your values? Most ‘gurus’ would tell you to build a lifestyle business, maybe take things online, or some other form of that bad advice. Somewhere along the way being a business owner that has a brick and mortar personal training business was bad. It’s as if you gave yourself a life sentence of working 18 hour days and being broke. That’s simply not true! You can make a six figure or more income, not just revenue, from your personal training business if you take the right approach. This approach requires that you make the scary transition from fitness pro to business pro. The transformation is only scary because many fitness pros jump right into it without a plan and without a clue of what’s really needed to become a business pro. The unknown is what scares us. Your clients are scared to start their fitness journey because the things they’ve tried haven’t worked and they don’t know what to do next. The exact same applies to you as a business owner. You’ve probably tried a lot to grow your business or escape the endless cycle of chaos in your business. If it didn’t work well, or you’ve found yourself back in that cycle, what’s next? Creating a plan for a successful personal training business is a lot like designing a great program for your clients. You must assess your weaknesses, identify your strengths and then develop a plan that helps you accomplish a clear goal. Instead of trying to tackle everything at once, you focus on a 4-12 week program that puts you on pace to hit your long term goals and adjust your programs when needed. Prescribing a training program and nutrition plan that will help a client lose 20 lbs is easy for you. The steps are clear and the path is obvious. But, when it comes to ramping up sales, building systems and developing into a leader that clarity is lost. We’ve laid out the steps in The Journey Of A Fitness Business Owner. The final big factor in making a successful transformation from fitness pro to business pro is your mindset. Negative self talk and head trash can keep you from developing the skills and having the courage to do what is needed to become a successful business pro. What’s holding you back? What is your next step in your own transformation from fitness pro to business pro? Maybe it’s just getting around the right people and having the right plan laid out for you. One guaranteed way to take a step forward in your transformation is to attend EFPS 2018! This is Fitness Revolution’s annual summit for personal trainers and personal training business owners who want access to the best info to grow their business. Jump on our waitlist to get VIP pricing and early registration for this amazing event. Join us on September 14-15th in Indianapolis this year! Hey Ryan, I completely agree that the art of sales and marketing is something that needs to be self-taught for personal trainers. 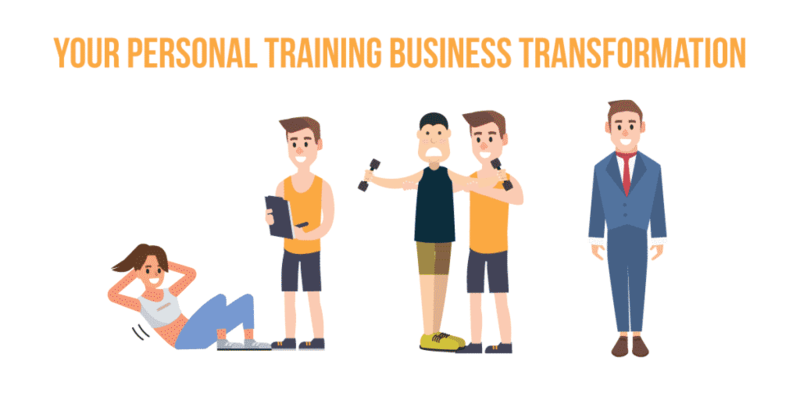 The personal training certifications and industry as a whole teaches you how to become a great trainer but basically nothing on the side of creating a business or filling up your schedule with clients. I like what you’re doing here on your website and keep up the great work!